figshare, an open data project with the ultimate intention to enable and encourage users to share all of their data whether published, unpublished or containing negative results, relaunched in the last 24 hours. What impact does its founder Mark Hahnel hope it achieves? Here Mark explains the new features of the site, how it will harness social media and ultimately offer an alternative for scholarly publishing. Jason Priem on the LSE Impact of Social Sciences blog. figshare is looking to change all this. Re-launched this week following investment from nature’s sister company Digital Science, figshare allows researchers to publish all of their research outputs in seconds in an easily citable, sharable and discoverable manner. All file formats can be published, including videos and datasets that are often demoted to the supplemental materials section in current publishing models. The free platform uses creative commons licensing to allow frictionless sharing of research data whilst allowing users to maintain their ownership. In a time when cash-strapped libraries threaten to end journal subscription deals over rising costs, alternative business models for scholarly publishing that take advantage of falling online storage costs and increasing global internet access must be considered. At the same time, basing the publication process online allows users to take advantage of new features that did not exist in the 17th century. An example of this is version control (a feature of figshare), making the content dynamic – just as the research process itself is. One of the inherent problems with this is the naiivity of researchers when it comes to their data. PhD students generally do not have a clue as they are rarely informed (as was the case with myself), and post-docs are often to terrified to try anything outside of the publish or perish mentality. There are some exceptions, where researchers are using existing online tools as a best fit model to publish their research, such as flickr or youtube. There are many JISC and DCC funded projects aiming to educate researchers about their data rights and the benefits of sharing research data. There is also an increasing list of research data management statements from stake-holders. Notably, the NSF in the USA which now mandates that all researchers when applying for funding must include “a data management plan in the form of a two-page supplementary document” and the UK government’s recent commitment to “transparency and open access to publicly funded data”. A crisis in academic publishing is “widely perceived” and online scientific interaction outside the traditional journal space is becoming more and more important to academic communication1. However, as with all cultural changes, a movement towards efficient, open, collaborative science requires both ‘carrots and sticks’ for researchers. Due to the sustained and increasing efforts of governments to encourage researchers to share all of their research data, figshare is focusing on providing immediate ‘carrots’ for researchers, demonstrating how they can improve their career prospects through open science. Prof. Peter Murray-Rust of Cambridge points out, “The primary purpose of publication for most academics is self-advancement”. 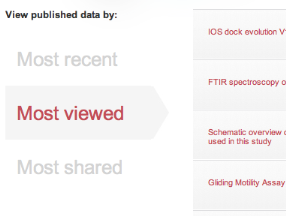 For this reason, figshare focuses on giving users credit for all of their research. By taking advantage of traditional measures of impact (i.e. the number of citations), as well as new measurements such as altmetrics, researchers get a greater level of information about the impact and reach of their research. They also get real-time measurements of the impact of their research and don’t necessarily have to wait for other researchers to cite it using traditional methods. By breaking research publications into their smallest unit the research becomes more discoverable, as search engines like google index each individual research object title and not a sweeping title for the whole research project, as is the case with journal publications. This public data is then easily searchable and browsable through figshare, with the ability to view the most shared and viewed in each research field. This gives researchers an idea of which research in their field is having the biggest impact in real-time. In a time where researchers have 24000 journals to browse2 (if they are lucky enough to have access), finding material that is relevant, timely and of importance can be difficult. As with all new technology, early adopters tend to reap the greatest benefit. In a research landscape that is becoming increasingly competitive, showing off your research may be the way to distinguish yourself from the masses. It has after all been postulated that “the new Einsteins will be scientists who share”!